2.0 Version(Latest Version) SHD High Speed HDMI Cable with Signal Booster Fit for All Your Devices with a Standard HDMI Interface. 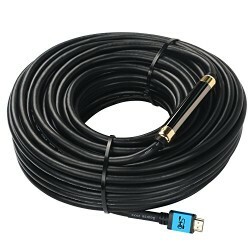 Good Quality and Durable HDMI to HDMI Cable 3FT / 10FT / 20FT / 25FT / 30FT / 40FT / 50FT / 75FT / 100FT Available. Built-in HDMI Signal Booster/Amplifier for Active Signal Amplification & Equalization. Automatically find the best available connection when connect two devices with different HDMI standards. Supports 4K x 2K 3D 1080P, Ethernet and Audio Return Channel CL3 Rated.High Speed HDMI 2.0V Up to 18Gbps Transfer Speed. Compatible with 4K(3840*2160@50/60HZ), 1440p, 1080p, 1080i, 720p, 480p, and 480i Resolutions.Supports 48-Bit deep color,True HD Dolby 7.1 and DTS-HD Master Audio. High End Metal Shell,24K Gold Plated Connectors.99.99% Oxygen-Free Copper Conductor Ensure the High-quality Image. Dual Shielding Al/Mylar and Tin Plated Copper Braiding for Shielding to Protect You Signal Interrupted from Out. 1 Year Warranty,Please Contact us if Our Cable Have Any Questions. 24K Gold Plated Connectors with 99.99% Oxygen Free Copper Conductor to Further Enhance Image/Sound Quality.